If Emory wanted TOD they could just as easily have built their new campus at Avondale, Kensington, Chamblee, Doraville or at one of the existing world class transit stations we've built on the south and west sides of town. No, it would not have been "just as easy". Just look at the zoning fight the Brookhaven TOD got. This "Highway-OD" got no real pushback. Did they even need to get so much as a variance to build this? Why would Emory spend the extra money to fight the zoning board and the neighborhoods to build a TOD when they can just build this car-centric develop that is already legal? We get the city we plan for and we are still planning for more sprawl and more cars. It would be nice if the south and west parts of Atlanta could get world-class children healthcare. OK, as long as we're dealing in what-ifs, how about this idea? A public-private partnership between MARTA and Emory creates a multimodal transit station, located in the Zonolite Industrial Park (adjacent to Emory, but unobtrusive to the surrounding areas. It would serve as a MARTA station and a terminal and staging area for CLIFF, Emory's tranportation system; the existing staging area for CLIFF abuts it on Johnson Rd. It could also provide parking for employees and patients of CHOA and Emory medical facilities. Patients would receive a CLIFF pass in their admission packet that would avail them and their families access to CLIFF transport; CLIFF already serves all areas under discussion. 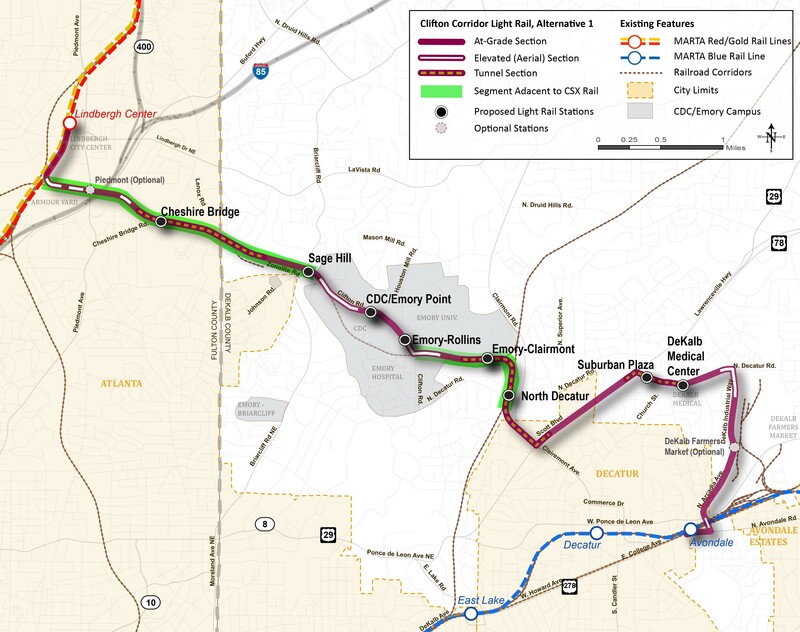 A feeder road could be run off of I-85 to the station that would parallel the proposed rail line to Emory. The goal of all of this would be to alleviate the inevitable increase in traffic on NDHR and Briarcliff as well as Clifton Corridor. Note the proposed rail route runs astride Zonolite Rd. It would be nice if Emory built on that side of town. They'd have ready-made world class transit from day one. Maybe Emory they are thinking it is sufficient for them to staff the facilities at Grady. I can't wait to ride the disease bus to see what I can catch next. It'll be free, so bring a mask and Purell. Like the proposed Sage Hill station? If Emory wanted to build TOD and a medical complex around one of the existing MARTA stations on the south or west sides of town the city would be doing backflips. No argument there. You'd be bringing world class healthcare to the people who do not have access to it.